What Ignited My Dream to Become an Entrepreneur and Help More Women of Color Do the Same | Yellow Co.
As her voice cracked over the phone, I knew the tears were starting to flow. Now, over 1,000 miles away from Los Angeles, the place I once called home, I listened to my grandmother recount her story — my story — of how she came to the U.S. over the phone. An election had just taken place, and some decisions had just been made that led me to want to discover more of my story, of my heritage. Dreamers, the very people who come to the United States with hopes and dreams to build something better, the very people who help build and make this country better, were facing the fear of deportation. Being the daughter and granddaughter of immigrants, along with the current political situation, caused me to want to dig into my roots. To know more about who I am, how I got here, and proudly represent my heritage. After asking around only to realize that nobody knew the story of how my grandmother immigrated to the United States, I decided to get it from the source herself. I interviewed my grandmother over the phone, and documented her story as told to me in her own words. Her journey of fleeing abuse, entering a foreign country (legally in her case) to be closer to her son and raising her children as a single mother provided depth to my own story. The sacrifices she made, the opportunities that she gave, and the determination to let family be the the most important thing led me to being born in the land of opportunity. An opportunity I would have never had if she had not chosen to give it to my father and I. Not only did she make that decision, but my mother, who came to the U.S. from Mexico too (legally as well), also created the origin of transition from a family being born and raised in Mexico, to a family being born and raised in the United States; starting with my dad, my brother, and I. When I recount this story, when I reflect on my heritage and the brave choices made by my abuelita and my mom, I am filled with passion and compassion. I am filled with a drive and determination to take life and give it everything I have. To show what I, a Mexican American woman, am made of. To be an example of my people, for my people and for this country. I was given the opportunity to live in a country where chasing my dreams is possible. Due to the sacrifices my family made, I have been able to pursue my business dreams. I can be my own boss, employ others, work alongside my husband, move states, travel, and give back to my community by holding business workshops in Spanish for undocumented immigrants. I can lead the way, and in turn provide the support to help others in my culture lead too. When I look around for women in leadership, I don’t see enough. 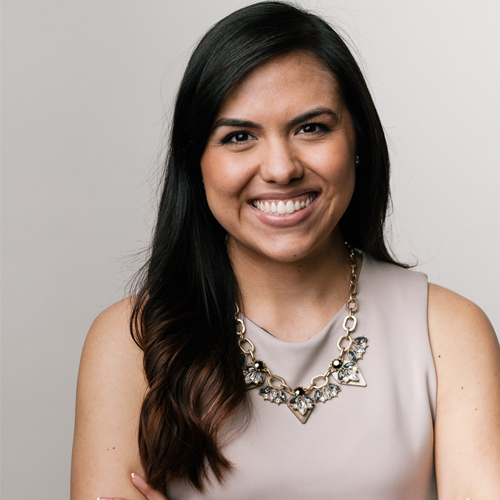 When I look for Latina women in leadership, there definitely are not close to enough. Today, I choose to be the change I wish to see in the world. And I have chosen to live it out as a business owner, entrepreneur, CEO, woman in charge, and a woman who CAN. Because of my grandmother’s and my mother’s choices, I was elevated in corporate positions in marketing and have worked for global companies. I have started and sold my first business, and created a second with my husband that allowed us to make our dream come true of moving to Seattle, with the flexibility to work from home and run a 6-figure agency while employing others. Additionally, I run a business where I teach women of color how to start and grow successful online businesses, and overcome the social and economical barriers minority women face that hold them back from being in positions of power and influence. I have been given the opportunity to excel, pursue my passion, perfect my craft, and rise up to give back to and help my own community. I am able to go after my dreams of seeing more women of color running businesses, pursuing their passions, and influencing our society. I acknowledge my opportunity. I want to pursue it relentlessly until the end of my days. To live out the legacy that was given to me. I want to encourage you today, as a woman, no matter what the color of your skin is or where you may find the roots of your story, know your heritage and live your legacy. To show the world the POWER of being woman. Be the woman. The world needs YOU desperately. We are waiting for you to rise up and live it. I’m cheering you on, every step of the way, to be the woman you were created to be each and every single day.